CA is an IT management software company, it has some very nice internet security software. CA Anti-Virus 2009 is a security product that provides comprehensive protection against viruses, worms and Trojan horse programs. 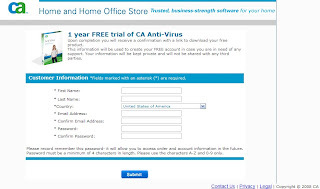 Now, CA has a promotion that giveaway CA Anti-Virus 2009 1 year long use code. If you like try you can simple go to this web page, just fill a forum about your information, it will send an active code to your email. You can download it here. CA Anti-Virus 2009 retail price is $39.99 with 1 year virus data update.